„Oh dear, we’ve spent our last vacation in topinambour. Beautiful, I can tell ya! 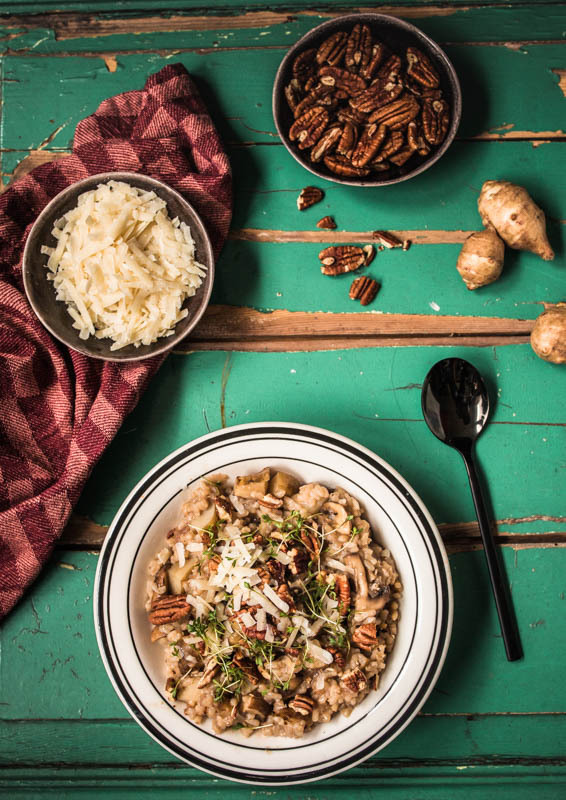 The locals there are so rooted to the soil and absolutely grounded.“ This could have been one of the unknowing reactions from my fellow people, when I told them about the awesome risotto with topinambour I made. Well, I guess there are quite a few peeps here, who won’t understand this joke, and might think I have a screw loose somewhere. But let’s start right from the beginning. Being a food blogger I do have a certain educational mandate and I couldn’t look myself in the eye anymore if I missed telling you about this delicious root vegetable. 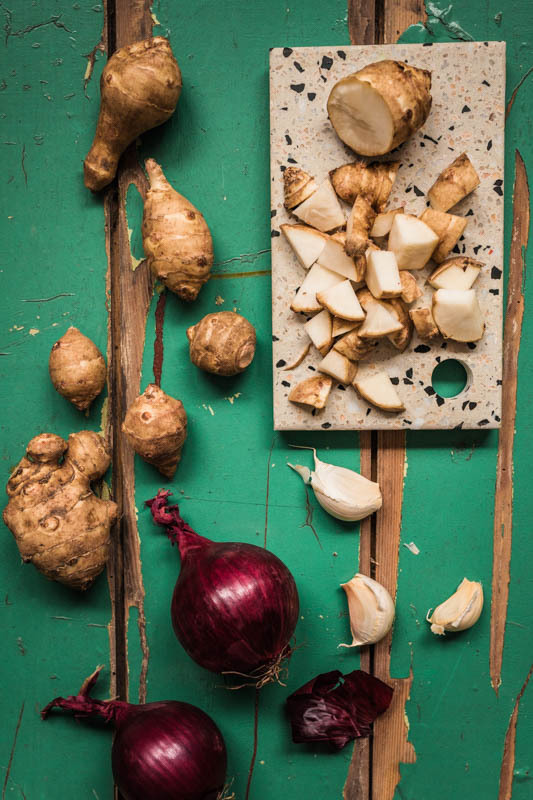 Topinambour, also known as sunchoke, sunroot or Jerusalem’s artichoke is a species of sunflower and native to middle and North America, probably deriving from Mexico. It’s like the sunflowers ugly, naked little brother. What does the sunchoke taste like? I am SO SORRY GUYS, but that’s the best I’m capable of!! How do you prepare sunchoke? Basically just like an ordinary potato. Boil it in salt water or roast it in the ofen. Peeling of the skin is way too distressing for me, so I just leave it. Oh, by the way, Auntie Google told me, topinambour is perfectly edible when raw and that its taste reminds a little of artichoke. I haven’t tested it yet, but maybe you’d like to. When is sunchoke in season? In Germany / Europe: Around September/October-ish until January-ish. I got mine from an organic supermarket but I’ve seen it lying around in discounters such as Lidl as well. No kidding peeps, the sunchoke is an amazing vegetable and made it onto my top 3 list of winter veggies. 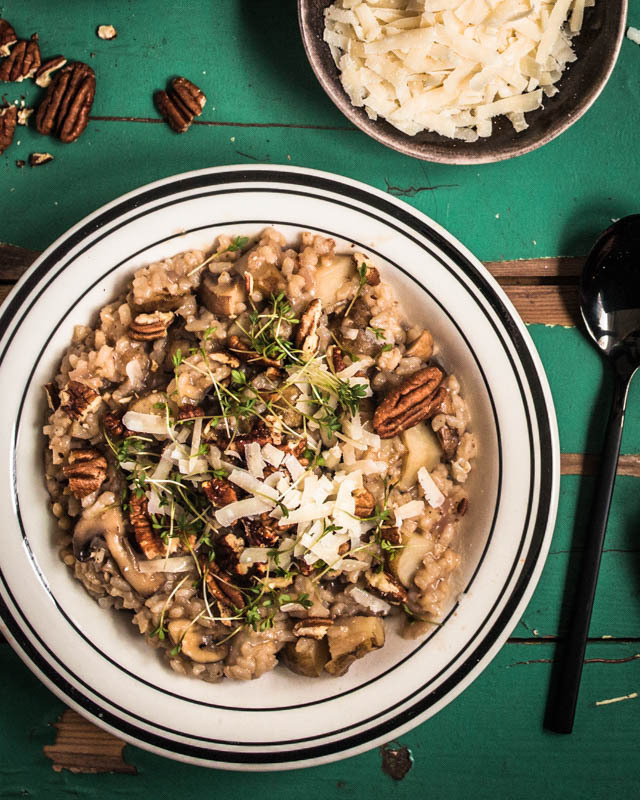 One of my favourite recipes I created with topinambour is this creamy topinambour risotto with mushrooms. The parmiggiano, fresh cress and roasted pecan nuts make it perfect. Clean and dice the mushrooms. Peel and mince the onion and garlic. Set everything aside. 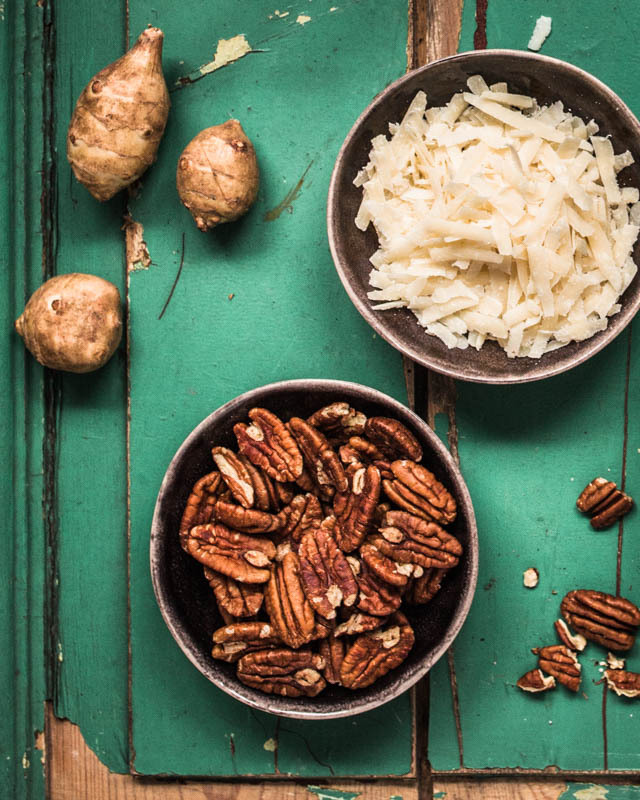 Roast the pecan nuts without oil in a pot until is smells deliciously nutty. Be careful not to burn them. Set aside. We'll be preparing the sunchoke with the skin. If you prefer them peeled, that's of course no problem either. Wash the sunchokes with cold water and dice them into bite size pieces. Add to a pot with salted water and bring it to a boil. Let it cook for 20 – 30 minutes until soft. You can test the softness with a fork / knife. Heat olive oil in a pan and fry onions and garlic in it until glazed. Add the diced mushrooms and fry it for a about 3 minutes. Lastly you add the risotto rice and fry it for another 2-3 minutes. Deglaze with a generous dash of apple vinegar (or white wine) and let it slowly vapour. Turn down the heat and add the vegetable broth bit by bit. Stir from time to time and only add more broth once it's soaked from the rice. 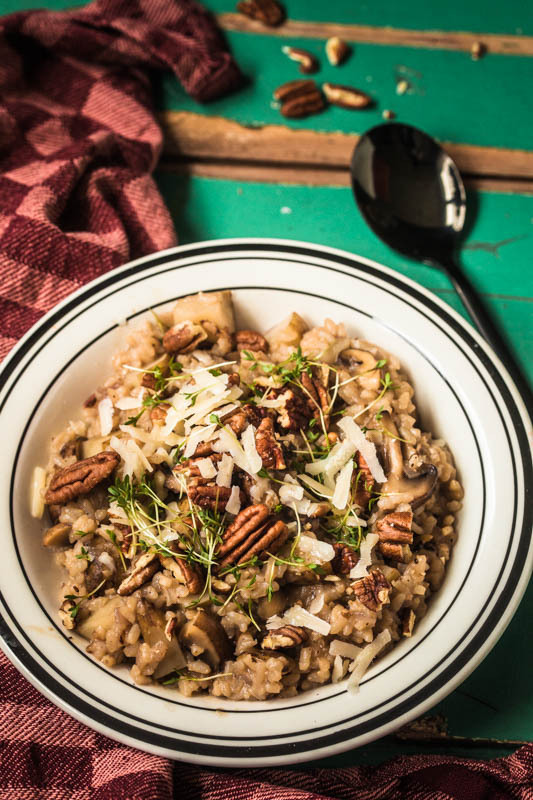 After about 20 – 30 minutes the risotto should be nice and soft, as well as the sunchoke. Drain off the water and add the sunchoke to the risotto. Stir together carefully. 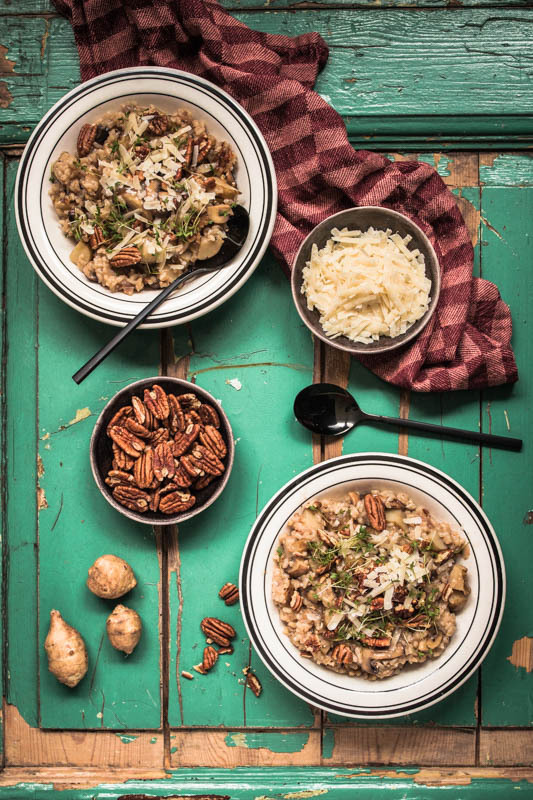 Serve your risotto in bowls or deep plates and garnish with parmigiano, chopped pecan nuts and some cress.